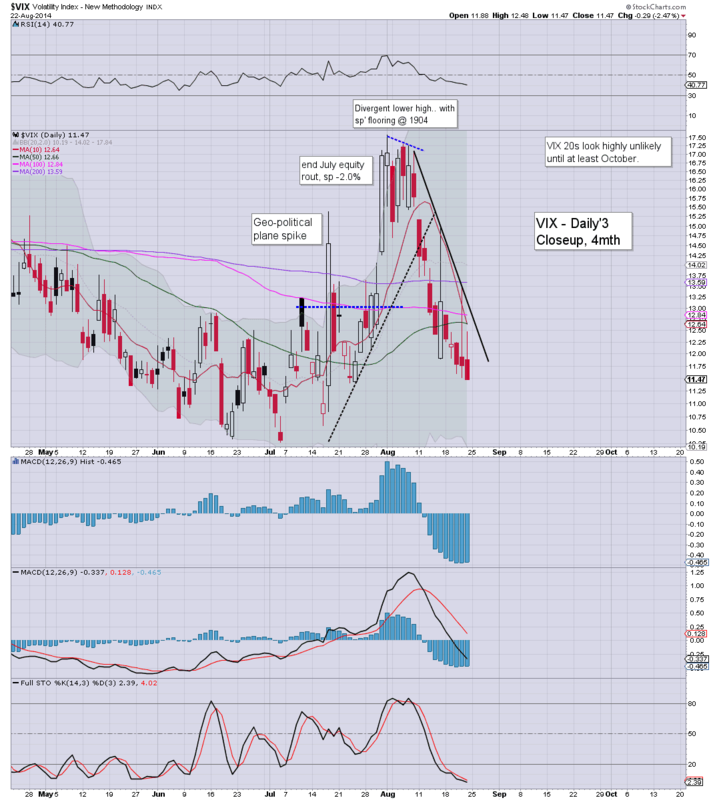 With US indexes seeing minor chop into the Friday close, the VIX was naturally muted, settling -2.5% @ 11.47. Near term outlook is for sp'2010/20s, which should equate to VIX 10s. 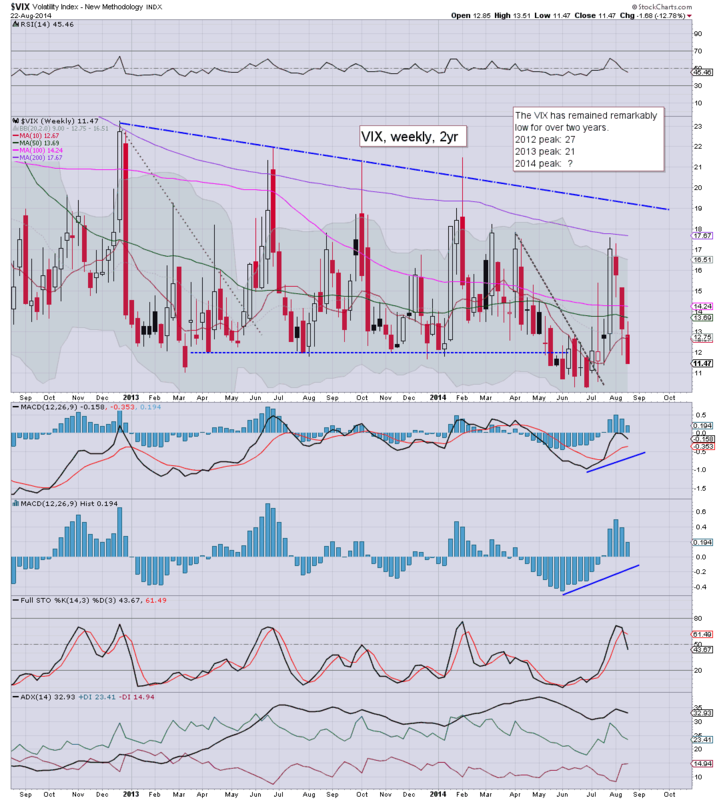 The VIX saw a net weekly decline of -12.8%. A third consecutive net weekly decline for the VIX. The recent peak in the 17.50s now looks a long way up, and we might not be at those levels again until October. 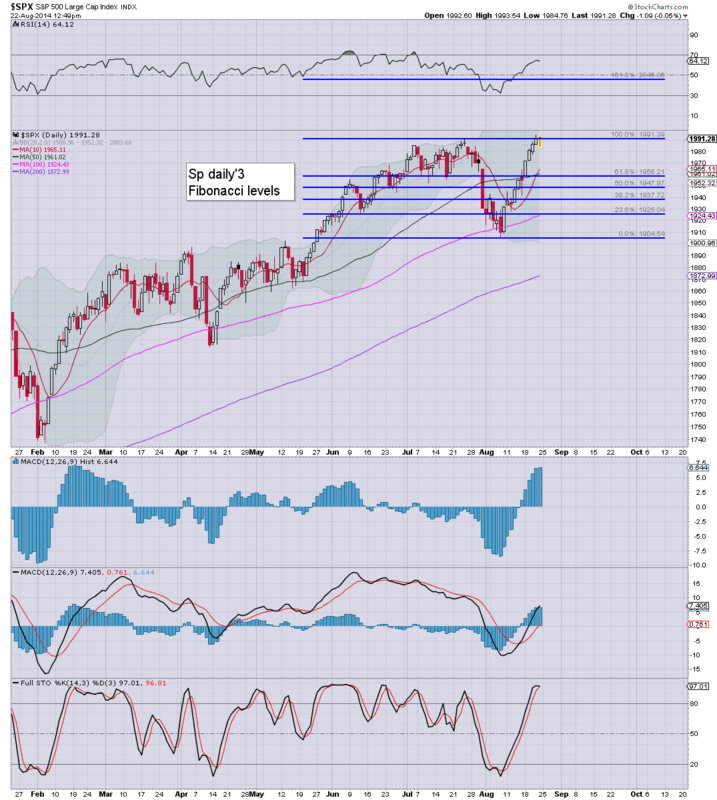 So... a third consecutive net weekly gain for the sp'500. It is highly notable that the upper weekly bollinger will be in the 2030s next week (its climbing around 10pts a week).. it won't be too hard for the bull maniacs to push the market into the 2010/20s by early September. For me, the only issue is whether we can hit 2030/50 zone before October. *I remain on the sidelines...for me..that is probably the better policy right now. The broad upward channel from the Aug'7th low of sp'1904 continues to comfortably hold. Sure, the bulls failed (a little surprising) to break sp'2000 today, but overall, net weekly gains of 1.75% are very decisive on any basis. VIX looks set to close the week on a down note... it will make for the 10th daily decline in 11 days. 3.13pm.. hourly MACD (blue bar histogram) looks floored. Nothing decisive yet, but considering the underlying trend, Monday looks set for further upside. The sp'2000s have taken longer than I thought likely (sure seemed viable in July)... but...anyway...next week. Shouldn't make any difference to those still holding long-indexes. VIX turns red... -1.4%.. low of the day. 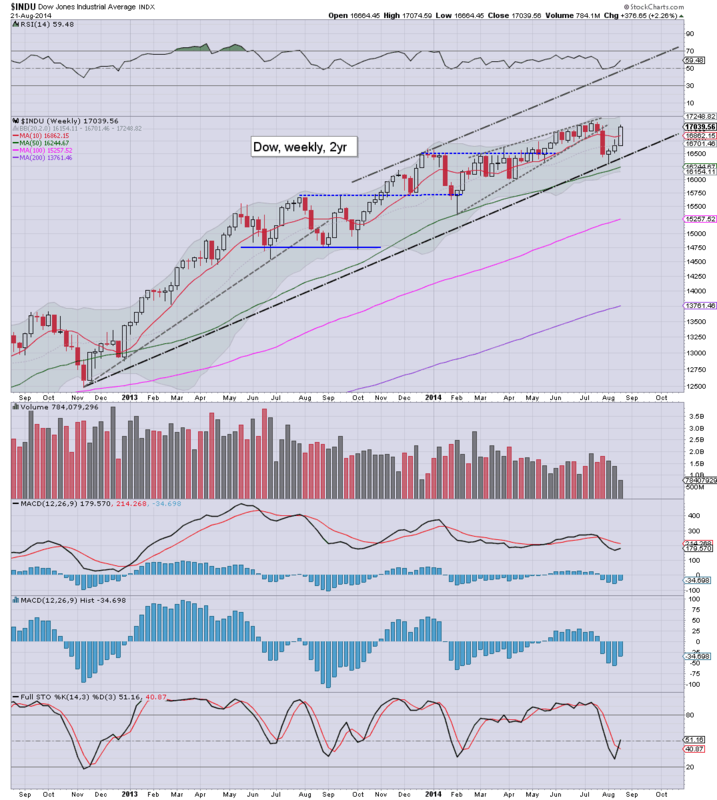 Dow set for a net weekly gain of around 2%... 350pts or so....a powerful gain. US equities are still seeing very minor chop. A daily close in the sp'1985/95 now looks assured. Metals are a little higher, Gold +$2. Oil is weak, but above the earlier low, -0.5%. Little to add, on what is turning out to be a very uneventful day. Yes..its just one of many upside outlooks, but hey... a 1.6x extrapolation of the recent down wave...offers the sp'2040s in September.. and I think that is a very valid target. Certainly though, that will likely take at least another 2-3 weeks. 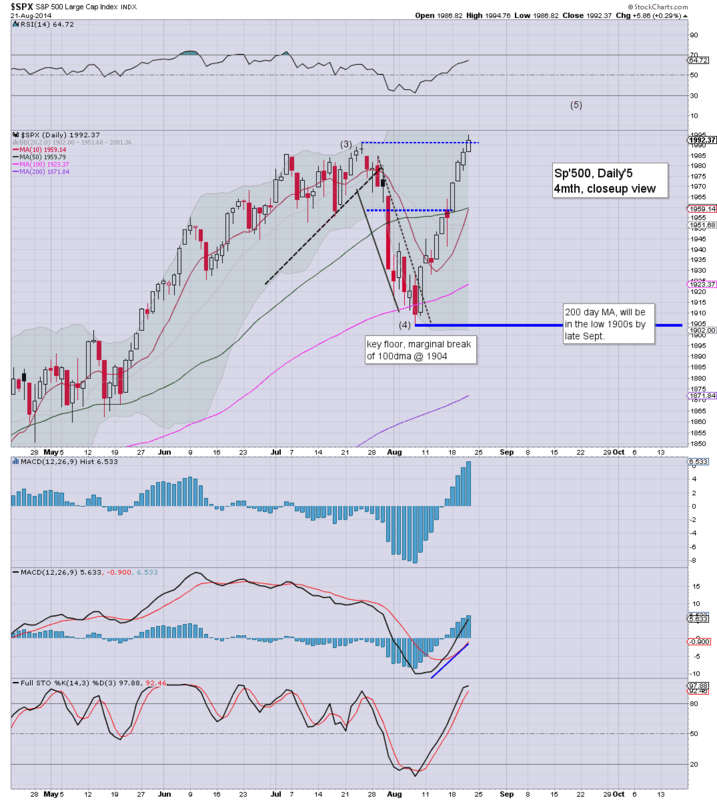 One of the doomers turns bullish... with (I believe) a target of sp'2300 by year end. 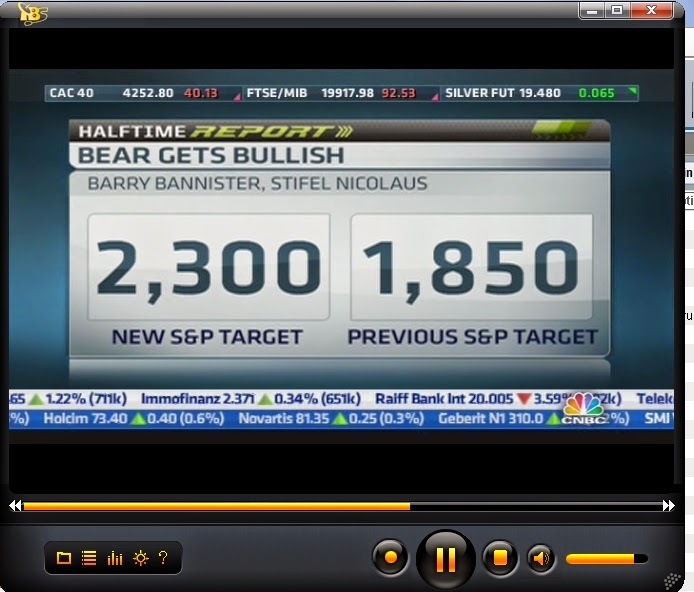 Another bear capitulates, make of that... what you will. US equities see a micro wave down to sp'1984... but there remains the incessant underlying upward pressure. 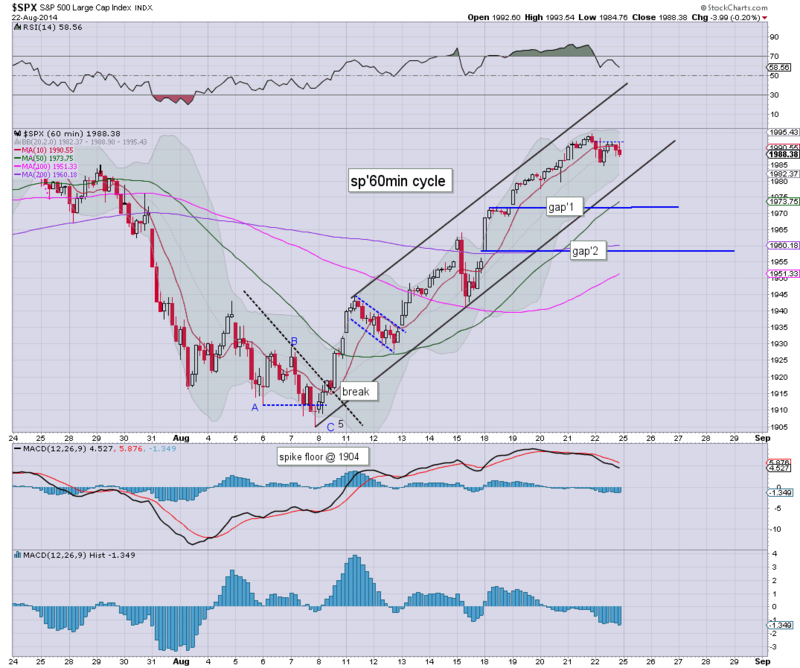 A daily close in the 2000s now looks unlikely, but still, the weekly cycles will be putting in a major net gain. Oil is still on the slide, -1.1%. With Jackson hole out of the way for another year... bulls have a clear run now until the next major econ-data point.... monthly net jobs.. but that is two full weeks away. Notable strength in airlines, DAL, UAL, both +1% or so. 12.20pm... GMCR.. I'd not noticed... I guess people still like coffee huh? Market back in melt mode.. .sp'1990.... hourly charts offering 1995 in the immediate term. 12.32pm.. Notable strength, R2K +0.3%.... easy upside of another 1% across the next day or two. As noted yesterday, the daily spike-floor candle, STRONGLY favours the bulls into next week. VIX +1.3%... still set to close red. Clearly, the market has managed to get through the FOMC minutes of Wednesday, and now Jackson Hole..without ANY significant damage. Primary target remains the upper bollinger on the weekly cycle.. currently in the 2020s, and that will likely jump into the 2030s next week. ...indeed, at the current rate, by mid Sept' , the 2040/50s look very viable, and that would make for a far better short level. 11.04am minor weakness... but it all feels tedious. I see a lot of counts out there, touting a sub'4 of 3... but really...difficult to fathom the micro nonsense. What is clear...broader trend is UP...as is reflected in the VIX that generally remains sub teens. ...standing by for the Yellen. Looking at the hourly cycle, equity bears just need a Friday close <1980.. to break the channel... that will open up two gaps... 1972... 1958. On no outlook do I see the 1940s being broken below until October. 10.08am.. Well, the speech is released, and the algo-bots are churning on it. Its starting to get real tedious again...micro chop. Even a test of the lower channel - 1980 at the close.. looks difficult. Maybe there is a Q/A later..where Yellen might say something 'stupid' ? Why wouldn't we see sp'2000s this afternoon? Its not looking good for those seeking a down wave beginning today. My concern is we'll just keep battling higher..to the upper weekly bollinger... currently 2022...and only slip back to 2000 (would make for a natural support). 10.47am.. tiresome micro chop.... absolutely nothing for bears to get excited about. Good morning. Futures are fractionally lower, sp -1pt, we're set to open at 1991. Metals are trying to bounce, Gold +$2. Oil remains weak, -0.4%. Fed chair Yellen is due to speak at Jackson Hole at 10am... and Mr Market will certainly be listening! There remains threat of a reversal, not least since we're now close to the upper bollinger on the daily cycle. Best case for the bears... a 2-3 day down cycle of 1.5/2.0%... to sp'1960/50s..with VIX 15s. Worse case... continued melt into the 2000s... 2010/20 by end month. Good wishes for Friday trading! 9.37am... ohh the humanity, sp -0.2%....the drama! It was just another day to the upside for the US equity market. Most notable, the Dow, which is so far up 2.3% this week, and 2.9% for the month. Further upside into September seems very likely, with an upside target zone of 17300/500. 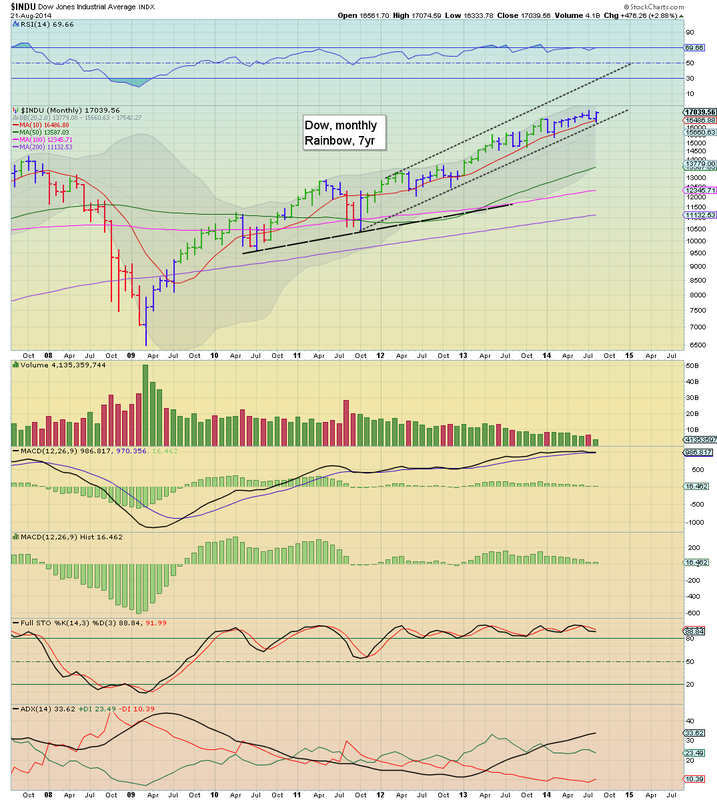 The mighty Dow is indeed presenting a powerful bullish candle this week, and it will make for the third consecutive weekly gain, and an important close above the weekly 10MA. The bigger monthly chart was offering the first outright bullish green candle since last December, this afternoon. The daily close was blue, but still, unquestionably bullish. Friday will be all about Yellen at Jackson Hole. I'm not even sure if we'll get a live stream of the speech. Regardless, market will want to make a play for the giant sp'2000 threshold. *next sig' QE is not until next Tuesday. Just consider that last Friday morning we were in the low sp'1960s. I exited long at 1962... a mere few hours later.. we were 1941. I'm a touch annoyed at not holding long another week, but really, I'm tired. If we get a pull back to sp'1960/50s.. I'll pick up an index long for a trade into September, otherwise... I'm content to sit it out until the current multi-week up wave completes in mid/late September. Keep in mind that I've not shorted the equity indexes since last summer, so..if I do go short this September, it'll be something of a major trade for me. ...and now for something rather different. US indexes settled moderately higher, sp +5pts @ 1992. The two leaders - Trans/R2K, settled -0.4% and +0.2% respectively. 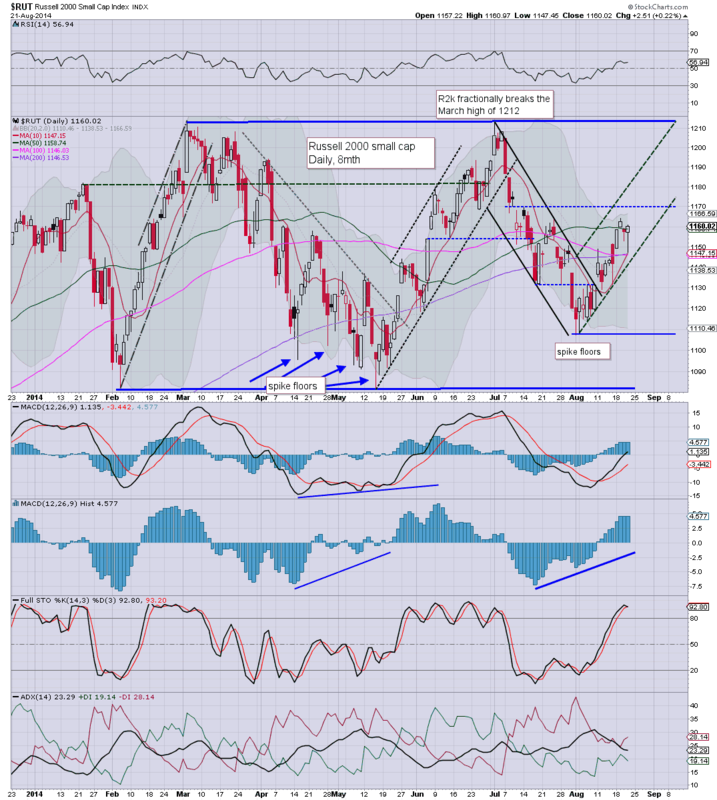 Near term outlook is for the sp'2000s, with 2010/20s viable by late August. The most notable aspect of today, the morning rebound in the R2K. An early decline of -1.0%, but managing to quickly claw to flat...and settling a touch higher. The sp' breaking a new historic high is merely reflective of what the Nasdaq accomplished last week. 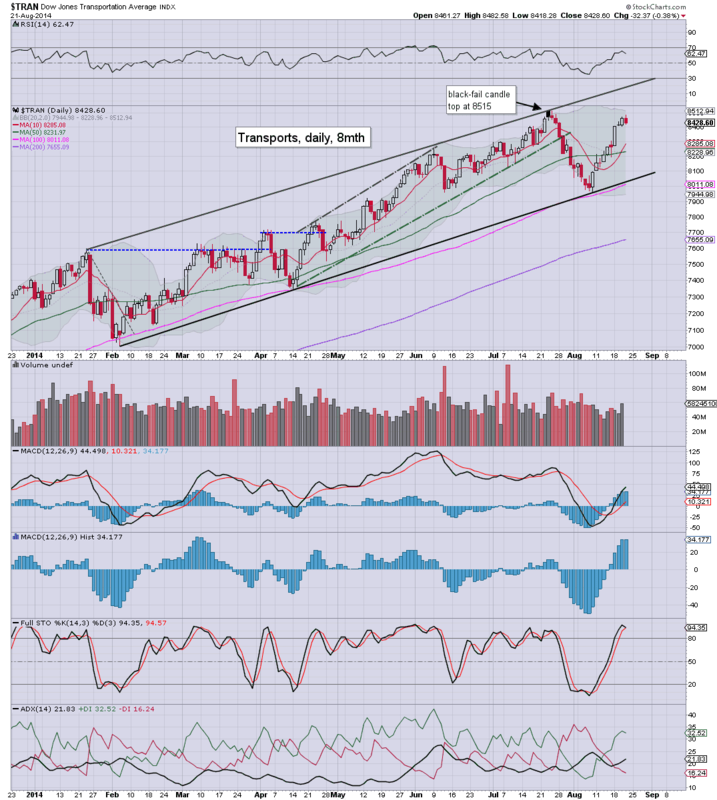 Dow/Trans both look set to set to follow within days.